Join us on April 6, 2019, at Studio IV for an energetic evening filled with artistry, cocktails, dancing, and entertainment. Arts + Crafts supports Higher Achievement where, we believe talent is everywhere, but opportunities are not. Higher Achievement works to close the opportunity gap for middle school scholars through rigorous academic Afterschool and Summer Academies, serving scholars with 650 extra hours of engaging programming every year. 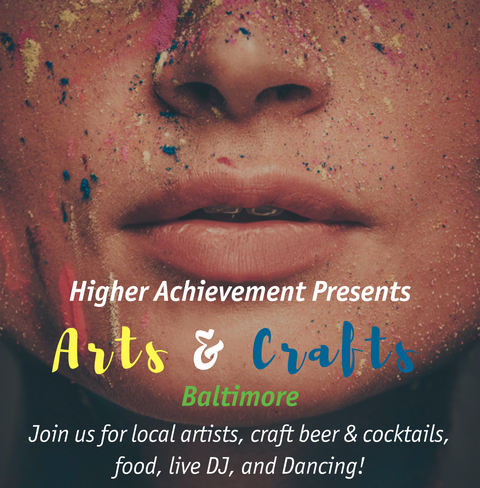 Higher Achievement is rising to the challenges we all know Baltimore City schools and students face by supporting scholars who need the knowledge and skills to successfully transition to high school, through college, and beyond.